The light, high-level Frederiksberg Slot was built in 1700 as a replacement for Prinsens gård, which was on land formerly leased by Amager peasants. The baroque garden in front of the castle probably followed a plan devised by Hans Heinrich Scheel, a captain in the Corps of Royal Engineers. The terraced grassy terrain and lime-tree flanked ramps still exist today. 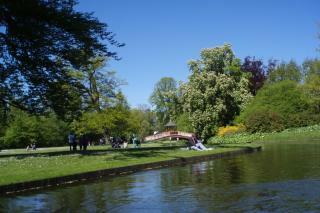 The rest of Frederiksberg Garden has been remodelled as a scenic garden with winding lawns, lakes, canals and spinneys as well as grottos, temples, pavilions and summerhouses. It may well have been based on Johan Ludwig Mansa's book on English-style gardening written in 1798. The Chinese-Anglo-Saxon spirit in Frederiksberg Garden is especially noticeable on the Chinese peninsula where you meet – in miniature - views and gentle surprises that stimulate your imagination and daydreams. Cross the vaulted bridge decorated with parasols and you will enter the garden. It is a lovely combination of grassy lawns nestling around the building, small groups of cherry trees and flower beds bordered with shells. The wooden Chinese summerhouse has red-painted columns and a curved roof with winged dragons at the corners. Inside are cabinets with lacquered doors and Chinese calligraphy. Frederiksberg Garden may well be Denmark's most verdant example of how flights of fancy and foreign inspiration can be captured in architecture.